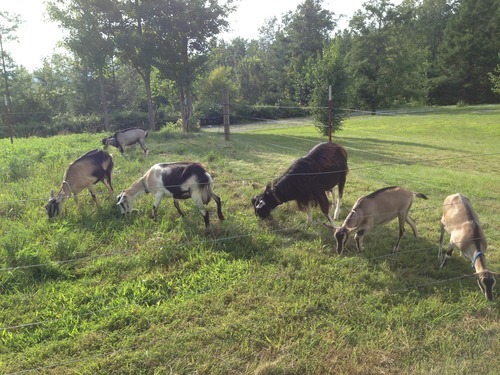 Hashem's Blessing is a goat farm located in Chuckey, Tennessee owned by Steve and Janet Haselroth . We're glad that you found us on Goatzz. Please take a look at our sales lists and enjoy learning more about our farm. We welcome your inquiries and questions! We have been raising French Alpines Dairy Goats for five years and have enjoyed it at the same time. We started caring for a couple of goats as a result of a couple of conversations we have had with some friends of ours. They were casual in nature, but I had always been interested in a farm of my own since I was a boy. I remember getting up with my grandfather in the mornings and going down to milk the cows. I remember wanting to try it myself; I had one opportunity, but I failed at the attempt. To me it was puzzling; I saw my grandfather squeeze the teat and milk would steam out. When I did it nothing happened. I remember thinking about it from time to time through the years and wondered if I would ever learn our to milk. Well, as I was saying, interesting things happen when my friends and I converse about things. In most cases, these times have a certain result whether it be a career path, a business, developing a skill, or hobbies; it seems that many of the things began with a good conversation, including marriage. Our first two goats were a buck by the name of Charlie and a doe by the name of Hope. Both were absolutely wonderful to have around. In the evenings after a full day of teaching, I was just as happy to see them as they were to see me. I found out that checking their water was such a delight and they seemed to enjoy the pellets they had for food as well. Probably the biggest problem I had was I knew relatively little about goat care and greatly depended on others.